If I go in my girls bathroom I’ll find at least 6 toothbrushes at any time… sadly I only have 3 kids that have teeth to brush. My girls have a love for all things teeth. We are probably one of the only families that flosses every night and will have kids wake up in the middle of the night and floss if they forgot. Yeah, I know we’re weird. Because of our crazy love for oral hygiene, we’ve partnered with Sunstar GUM to bring you guys a chance to win some new products! Sunstar GUM believes that when you have healthy gums, you have a healthy life and they back that up with quality products. Their mission is to enhance the health and well-being of people everywhere through its four business areas: mouth and body, health and beauty, healthy home and safety & technology. 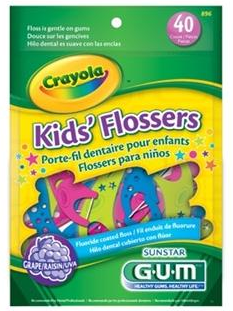 GUM sent me some products to try out for myself, and on of my favorites is the Crayola Flossers. It’s dental floss that comes in easy to handle shapes, and a tasty grape flavor. We were already slightly addicted to flossing, by flavored floss has only made this worse better. They also sent a Timer Light Toothbrush which is ideal for my 4 year old. She knows how to brush, but doesn’t usually stick with it as long as she should each night. This flashes a light for two minutes and she knows to stop when the light stops blinking. Don’t worry, GUM has flossers and toothbrushes for adults, too! Since I know we’re all constantly in search of a good deal, GUM has a discount for Southern Savers readers! Use the code 1012SS for 15% off and free shipping on order over $15. Leave a comment below telling me which of the products above you have to have in your house. This giveaway was sponsored by Sunstar, but all opinions are 100% my own. Winners for this giveaway will be chosen Monday, 10/8.